I’m back with this month’s Soup Saturday Swappers! This month’s theme, English Stews, was chosen by Sneha from Sneha’s Recipe. English stews are actually pretty hard to come by. I found lots of stews shared by British chefs, but does that automatically make it a British stew? I say no. Just because I learned how to make croissants does not automatically make them an American food. 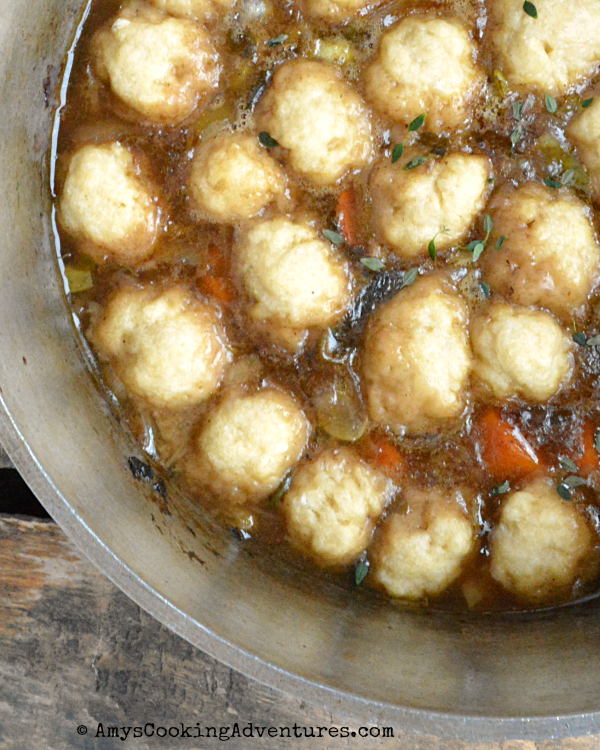 After quite a lot of searching, I came across a couple recipes for British Beef Stew with Suet Dumplings. Finally – something that sounded like it might have originated in England! Now, since I’m in the US, suet is not a pantry staple. Suet appears to be a type of rendered beef fat, so, like I do for anytime anything calls for rendered fat, I substituted bacon grease. The stew itself starts with some beef seared stove top. Then all manner of yumminess and some broth are added and the stew gets to braise in the oven for a couple hours. Meanwhile, the dumplings are made and added for the last 20 minutes of the cooking time. The verdict: The stew was delicious, but the dumplings were not. The dumplings were dense and had an odd, greasy texture. 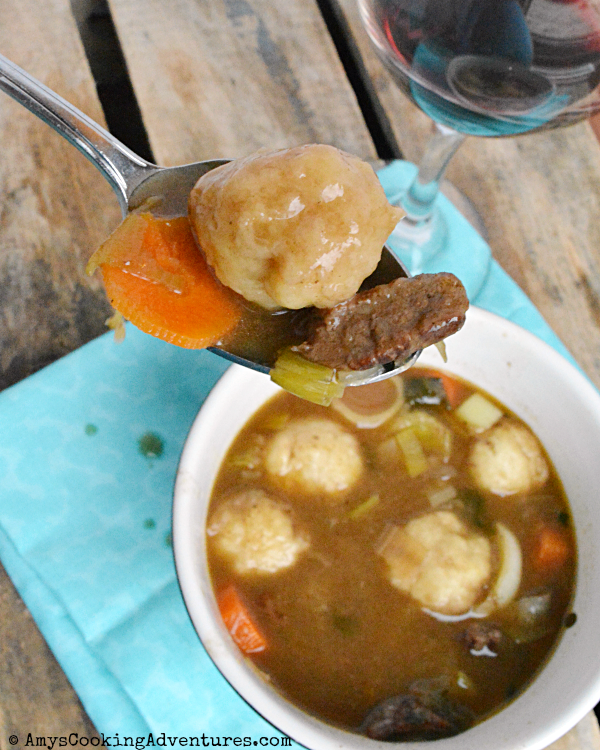 I ended up tossing the dumplings and serving the stew with some crackers. 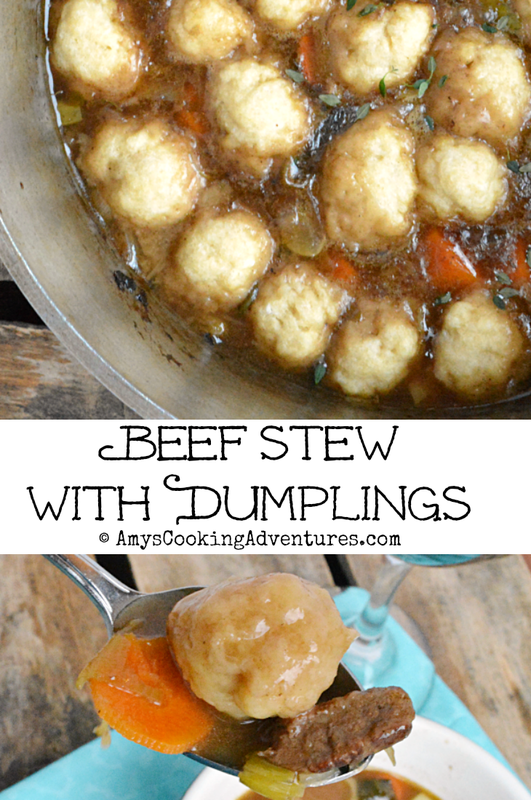 If I were to make this again, I’d completely forgo the dumplings. I don’t know if my bacon dripping substitution is the root of my failed dumplings or if I just don’t like dumplings in my stew! Preheat the oven to 350 degrees F. Place the oil in a dutch oven over medium-high heat. Add the meat and brown on all sides. Deglaze the pan with a splash of wine. Add the vegetables and cook for 2-3 minutes. Sprinkle with flour and continue cooking for an additional 1 minute. Deglaze with more wine, taking care to scrape all of the browned on bits off the bottom of the pan. Pour the beef, broth, salt & pepper, and herbs. Bring to a simmer, cover, then place in the oven to cook for 1 ½ hours or until the meat is tender. Stir together the flour, baking powder, salt, bacon drippings, and water to form a dough. Roll the dough into small balls and place in the stew. Cook for an additional 20 minutes or until the dumplings are tender and puffy. Preheat the oven to 350 degrees F. Place the oil in a dutch oven over medium-high heat. Add the meat and brown on all sides. Deglaze the pan with a splash of wine. Add the vegetables and cook for 2-3 minutes. Sprinkle with flour and continue cooking for an additional 1 minute. Deglaze with more wine, taking care to scrape all of the browned on bits off the bottom of the pan. Pour the beef, broth, salt & pepper, and herbs. Bring to a simmer, cover, then place in the oven to cook for 1 ½ hours or until the meat is tender. Stir together the flour, baking powder, salt, bacon drippings, and water to form a dough. Roll the dough into small balls and place in the stew. Cook for an additional 20 minutes or until the dumplings are tender and puffy. I'm sorry your dumplings didn't turn out as you had hoped. The stew certainly looked wonderful. 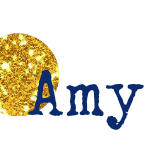 I wrestled with recipes for this post, too. I settled on a very similar recipe. Too bad it was a lot of work for no return on the dumplings, at least the stew was a success! At least you like the stew itself! I love any sauce with deglazed beef bits. So good.